One of our all time favorite brands, Heaven Skincare, was recently written up on New York Social Diary and we wanted to share it with you. When she was 16 years old, Carla Sayer got into a bad automobile accident. The car in which she was a passenger was hit and one of the back windows smashed into her face. She was rushed to the hospital where doctors spent the next four hours removing shards of glass from her left cheek. She was subsequently put on steroids because of other injuries sustained in the accident. The steroids, according to Carla, resulted in severe acne. To control the acne, she was prescribed a birth control pill but when she stopped taking the pill several years later, the acne returned with a vengeance. With a face full of angry lesions, a distraught Carla was on the verge of canceling a much anticipated reunion with a long distance boyfriend. 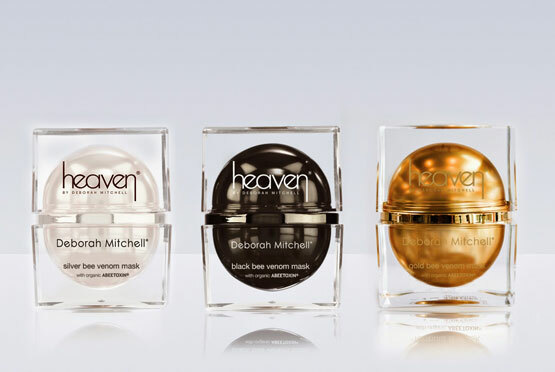 Enter some divine intervention in the guise of Deborah Mitchell’s Heaven Skincare. An acquaintance of hers who worked for the product line recommended she use the Hydro Cleansing Milk, the Peppermint Clarifying Lotion and the Youthful Moisturizer twice a day and nothing else. Carla followed her advice and five days later, when she stepped off the plane to meet her boyfriend, she had only one spot on her face. The star ingredient of the line is bee venom. Deborah’s patented Abeetoxin, a complex formulation of bee venom, honey and botulism – a natural form of the toxin used in Botox that can be harvested from beehives – has generated a good deal of buzz for its smoothing effects. Her bee venom facials have been credited with taking years off the Duchess of Cornwall’s face. Deborah won’t discuss her work with the royals, but it is said that Kate Middleton enjoyed one of her facials just days before the royal wedding, having been introduced to Deborah and her products by Camilla Parker Bowles. Other celebrities who have swarmed to Heaven Skincare include Gwyneth Paltrow, Kate Hudson, Victoria Beckham, Nicole Kidman and Kylie and Danii Minogue. Nor are men strangers to the products. David Beckham, Simon Cowell, Jack Nicholson and Robert Downey, Jr. also count among the devotées. Indeed, 30% of Heaven’s customers are men. Intrigued, I wanted to meet the queen bee behind this luxury skin care line. Not only did I learn a bit about the ingenious formulations, but I walked away completely energized for Deborah’s story is nothing if not inspiring. The self-described “working class girl” turned herself into a bona fide business mogul. Last year, 24 years after its inception, Heaven Skincare earned a reported $45 million in revenues. The products are sold worldwide through its website and via stockists in 15 countries including the United Arab Emirates and China. Blonde and glamorous, Deborah greets me with a big smile and a warm hug at the posh Langham hotel in London, her home away from her country home. Over a glass of bubbly and some hors d’oeuvres, the daughter of a hairdresser and owner of a courier business, tells me of her humble beginnings. 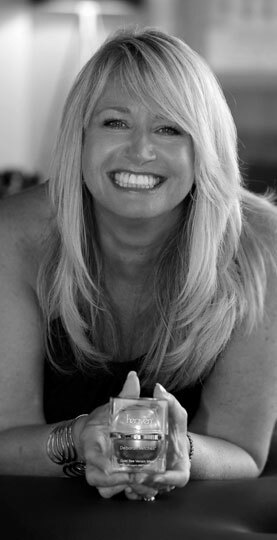 The English native got her start in the beauty industry at the tender age of 17 by working as a door-to-door manicurist. “I started off with one £10 pack of nail extensions and my first customer gave me a £1 tip,” she recalls, revealing that she couldn’t afford to buy many products, so she began making her own. Armed with knowledge gleaned from cosmetic science classes and with a degree in lab science, she began experimenting with various formulas. According to Deborah, she suffered from severe acne in her youth and acne products left her red-faced. So, she came up with a soothing chamomile mask. More products followed, to be snapped up by her clients, and it wasn’t long before Deborah started giving facials. Her first treatment room was the handicapped bathroom of a gym in a Holiday Inn. In short order, her facials became so popular that she graduated to London’s prestigious Hale Clinic. The Bee Venom Mask is sold in three tiers, starting with silver, which contains the lowest amount of Abeetoxin, then black, and up to gold. Deborah recommends the more potent black one for men as they have thicker skin. The venom in the gold mask is collected from the queen bee. This is very rare – nearly impossible to obtain – as there is only one queen bee per hive. The price of one ounce of bee venom costs $38,000 and that of one ounce of venom from the queen bee is $140,000 according to Deborah. Our beauty expert, Alyssa Barrie, uses the Silver Mask daily, putting it on over her moisturizer and eye cream. “You need very little,” she advises. The bee venom in the resulting Abeetoxin fools the skin into thinking it has been lightly stung. This causes blood to flow towards the skin and stimulates the production of collagen and elastin. Deborah makes the process through which the venom is harvested sound simple: “We release a small electrical current through a pane of glass that causes the bees no harm but encourages them to sting the glass, depositing their venom. When a bee stings a person, the stinger gets released into the flesh, causing the bee to die. But when they sting glass, the stinger can’t come out because it’s too hard, but their brain tells them they’ve stung, and so not to sting again.” Due to the fact the she actually saves the lives of bees, Deborah, who donates a portion of her profits to bee charities, has been named an official Guardian of the Bees in the UK. “We have something for every pocket with our travel size options,” says Deborah. The Long Weekender Kit retails for $45 on NYSD Beauty and contains a cleanser, exfoliant, toner, moisturizer and the silver bee venom mask. Our beauty experts at NYSD Beauty also swear by the Vanilla Pod Hand & Nail Cream. The cream’s vanilla scent is even purported to act as an appetite suppressant! Not surprisingly, imitators have jumped on the bandwagon but Deborah is quick to point out that her competitors use freeze-dried bee venom which is ineffective according to the skin care guru, whereas her products contain real botulism found in the hive. As industrious as her beloved bees, this 50-year old mother of two does not rest on her laurels. Debuting this summer is Bee Peel, an intensified facial peel for home use which again harnesses the power of bees. “It gives professional results without the downtime of regular chemical peels,” discloses Carla, who ten years on, still only uses Heaven products. Expert tip: When it comes to exfoliation, forget the “once a week” rule. Exfoliate as and when you like, as long as your skin can handle it. I like Heaven’s Bee Polish which combines bee venom and botulism with raw cane sugar. It’s gentle on my sensitive, dry skin, leaving it smooth and reflective. Plus, it doesn’t contain those environmentally damaging microbeads. I also like the Clarifying Hydrogel (as a toner) which has a cross polymer interlocking (net-like) firming action. Both are in NYSD Beauty’s Long Weekender Kit.